PartnerRe is a global reinsurer with more than 20 years of risk assumption experience across geographies and risk types. 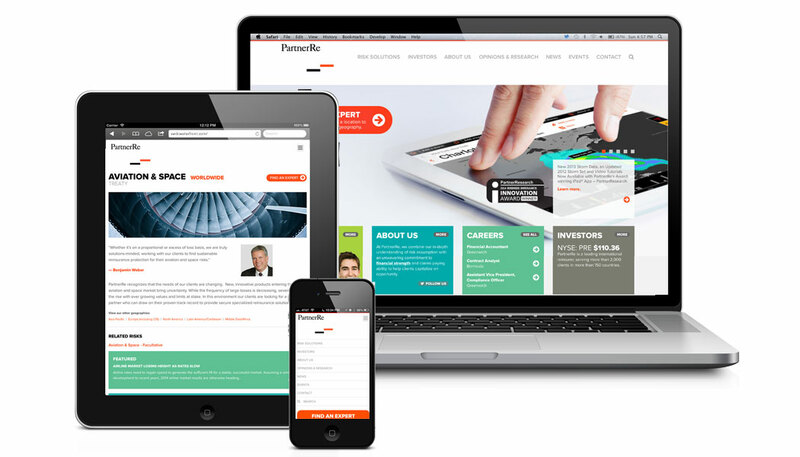 As a result of evolving economic realities and recent acquisitions, PartnerRe needed to retell its story through refreshed messaging and a new website that could fulfill a list of complex needs: be more mobile-friendly with the use of responsive design; introduce a simple, more user-centric navigational structure; incorporate a robust search functionality; integrate existing microsites built on the external platforms of SNL and CVENT; better integrate social and digital media tools; optimize for search engines; include flexibility of an extranet; and accomplish all this on a user-friendly content management system with a design that could visually “warm up” the brand as well as introduce a dynamic “brochure-building” tool dependent on a variety of selections made by the user. In addition, our solution had to meet the separate and sometimes competing needs of highly sovereign and segmented business units — while providing one streamlined, cohesive user experience that did not reflect these differences. This project was built on substantial research and highly collaborative, outside-the-box solution building. After separate interviews with each member of the Bermuda-based communications team, as well as attending and then interviewing stakeholders at the annual meeting, our joint task force met to identify consistent business needs and translate them into a solution that could also be user-centric. With hundreds of potential ways to deliver their message — all dependent on the location, risk, and type of business that was involved — we ultimately designed a dynamic risk-selection tool that allowed users to immediately find the appropriate underwriter contact or high-level brochure information specific to that particular request. To more easily manage so much complex information, we also built certain sections of the site in such a way that they could be automatically generated, allowing the back-end user to make drop-down or drag-and-drop selections rather than having to hand-code or manually enter information on each page. The solution was well-received across business units and launched in early 2014.